According to the CFTC Commitments of Traders report for the week ended October 2, NET LENGTH for crude oil futures dropped as prices were peaking. Meanwhile, NET LENGTH heating oil and gasoline futures increased further, and NET SHORT for natural gas futures declined. Speculative long positions of crude oil futures added +6 685 contracts, but was more than offset by the bigger increase in shorts (up +17 861 contracts). This resulted in a decrease in NET LENGTH, by -11 176 contracts, to 548 909 contracts. During the week, the front-month WTI crude oil contract jumped +4.08% while the corresponding Brent contract was up +3.58%. For refined oil products, Net LENGTH for heating oil futures added +4 150 contracts to 48 513, while that for gasoline added +481 contracts to 112 641. During the week, the front-month Nymex heating oil contract soared +4.44% while the RBOB gasoline contract was up +2.86%. Net SHORT for natural gas fell -12 617 contracts, to 26 023 contracts for the week. The Nymex natural gas contract gained +2.73%. The market continued to anticipate higher demand amidst cold weather. On the precious metal complex, gold and silver futures stayed in NET SHORTS for another week. The phenomenon will likely persist as global yields soar, raising the opportunity cost for holding precious metals. Speculative long positions for the former slipped -450 contracts, while shorts rose +3 724, raising the number of NET SHORT, by +4 174 contracts, to 21 822. 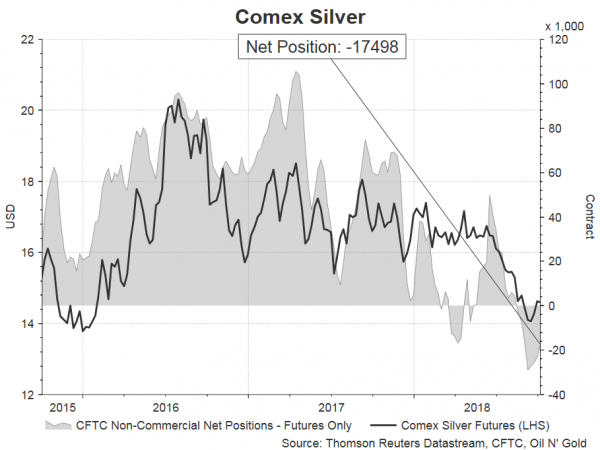 For silver, speculative long positions were trimmed by -3 261 while shorts plunged -9 018, trimming the number of NET SHORT, by -5 757 contracts, to 17 498 contracts. For PGMs, NET LENGTH of Nymex platinum futures added +4 359 contracts to 7 049 while that for palladium gained +422 contracts to 10 112.